Just Doing Sudoku Puzzles Can Prevent Mental Decline - The Word Finder Blog! 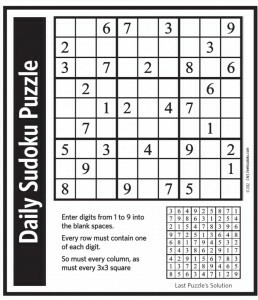 An Indian Newspaper last week reported a new study that found that doing a daily Sudoku could lead to significant and measurable improvement in memory and mental cognition. The Deccan Chronicle reports in fact that researchers found the increase to be better than the improvements of mental acuity gained from exercise or vitamins. WOW! Keep doing those Sudoku Puzzles people!